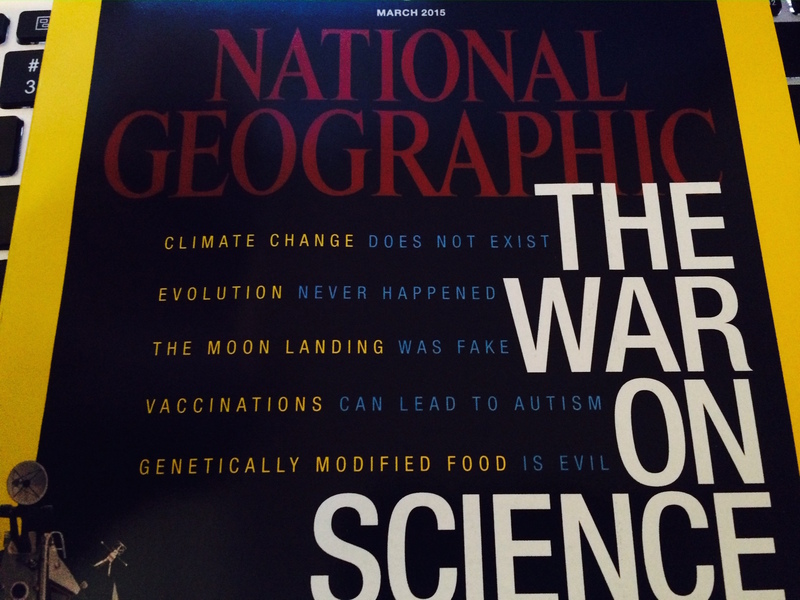 The cover of this month’s National Geographic magazine is causing some major controversy among the cognitively aware, as this once-upstanding and generally unbiased nature periodical has quite obviously fallen headlong into the clutches of corporate-controlled propaganda and lies. Outlining what it says are some of the basic tenets of “The War on Science,” National Geographic likens having concerns about the safety of vaccines, fluoride, and genetically-modified organisms (GMOs) to believing that the moon landings were faked, or that the earth was made flat by Jenny McCarthy, or something (because science!). Climate change does not exist. The moon landing was fake. Vaccinations can lead to autism. Genetically modified food is evil. In a corresponding article, one of National Geographic‘s writers openly patronizes “conspiracy theorists” who dare question things like injecting mercury into children (vaccines) and lacing the water supply with pesticide byproducts (fluoride) — things that the author suggests are completely normal practices that have been “thoroughly established” as sound science. Concerns about the safety of vaccines and fluoride must be gaining a wider audience these days, otherwise a major establishment publication like National Geographic wouldn’t feel the need to even address the issue. But what is a magazine that claims to support science doing actively opposing science, all in the name of science? Robert Scott Bell addressed this topic during a recent episode of his show that aired on February 25, challenging the assumption that holding one or more of these beliefs somehow defies science. Co-host Ty Bollinger also crushed the notion that raising valid questions about things like vaccines and GMOs constitutes “denialism,” demonstrating instead how the establishment is the one in denial. “They say that ‘denialism’ is about tactics rather than politics or partisanship,” stated Bollinger during the segment.